When first answering this question, you may be thinking of examples like water bottles, bags and straws. While plastic has been widely used for over a hundred years, it’s much more than just a water bottle or milk jug. Plastic is a moldable substance composed of synthetic (human-made) materials, made from polymers, which are long molecules built around chains of carbon atoms. It was a real game-changer for many industries and now there are many types of plastic used in everyday life. Different compositions produce different types of plastic, each with unique characteristics. While there are hundreds of different types of plastic, the following are the 6 most common types of plastic used in America today. PET or PETE – Polyethylene terephthalate, or polyester, is most commonly used as for thermoformed sheets in manufacturing, clothing fiber, strapping and soft drinking bottles. This plastic is very durable and resistant to many chemicals. It also has a high tensile strength so it is strong, while still being lightweight. PET is clear in appearance and maintains it shape well. 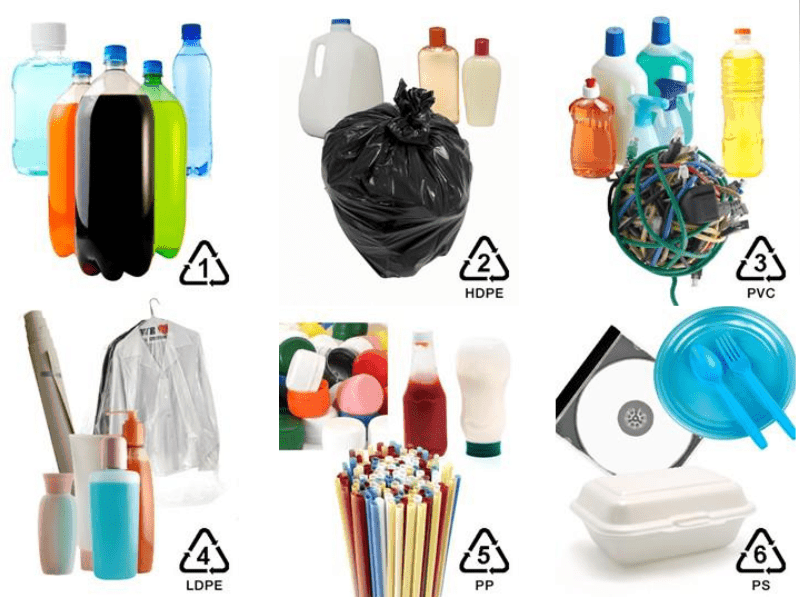 HDPE – High-density polyethylene is a thicker plastic which is used to make milk jugs, laundry detergent bottles, playground equipment, plastic lumber and recycling bins. This plastic is known for its strength, durability, and weather and chemical resistance. PVC or V – Polyvinyl chloride is most often seen in piping, fencing, shower curtains and non-food bottles. This material is very dense and rigid and has a high tensile strength. LDPE – Low-density polyethylene is a lighterweight and more flexible plastic that is used to make plastic bags, tubing, laboratory equipment and various containers. LDPE is quite flexible and strong and has a high resilience towards environmental factors like moisture, extreme heat and cold. PP – Polypropylene is commonly used for auto parts, industrial fibers, food containers and dishware. Polypropylene is often transparent in appearance, has a high heat resistance and is very stiff. It is also more stretchable when heated than other plastic materials. PS – Polystyrene can be a hard plastic used for desk accessories, food trays, utensils, toys and insulation boards, as well as a rigid foam material form. The hard plastic is very stiff and strong, and the foam material is often used for packing material and is soft and moldable. What else do these plastics have in common? All of these types of plastics are recyclable and can be produced from recycled plastic. But what are the sources of recycled plastic? Post-industrial waste is generated during a manufacturing process. Post-industrial plastic is created when a company manufactures plastic goods and has plastic material or “scrap” leftover that isn’t used in the final product. Oftentimes, companies who are producing plastic products or have a lot of scrap plastic material will sell their waste to be recycled and reused. 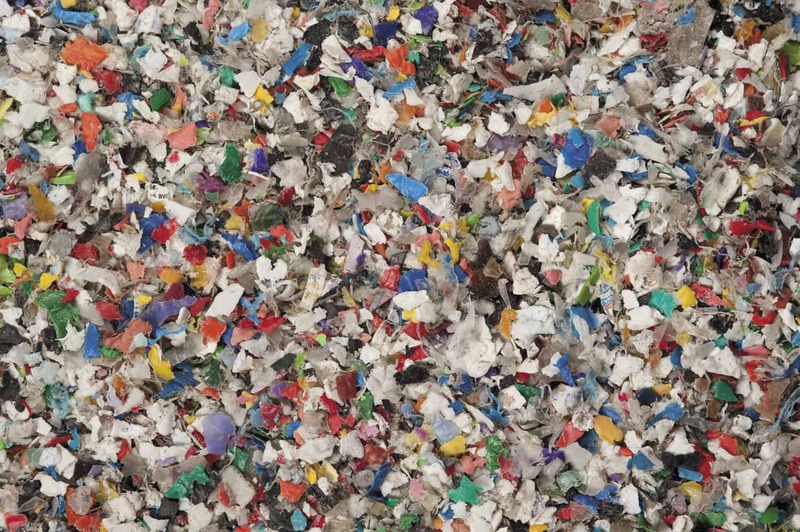 This scrap material is typically “cleaner” due to less contamination and mixed content. Post-consumer waste is recovered from the consumer supply chain. It is any item that has been diverted from disposal in a landfill. This plastic waste is more contaminated (food residue, other recycling material, etc.) than post-industrial waste, but is “greener” because it has either been recycled or saved from becoming waste in a landfill. There are many ways to dispose of plastic waste, and recycling both post-industrial and post-consumer plastics help reduce pollution levels and encourage a cleaner environment by keeping this waste out of landfills. Both companies and households are able to recycle their plastic products for reuse. Plastic lumber has many benefits that traditional wood doesn’t provide: durable in harsh weather, resists insects and mold and doesn’t splinter or rot. It also doesn’t require painting or staining because the color is manufactured throughout the product so it won’t fade like traditional wood. Plastic lumber also offers a similar installation experience as wood because it cuts, drills, screws and saws like traditional wood. It is a strong and durable product that can withstand extreme weather conditions: from rain and snow to extreme heat and cold, plastic lumber will hold up better than traditional lumber. For outdoor applications, plastic lumber is insect, pest and mold resistant, so areas where there are high moisture levels are no match for plastic lumber. Other benefits include increased resilience over wood, meaning that plastic lumber can “take a bigger beating” than traditional wood. Impact to plastic lumber is deflected better than traditional wood and won’t cause breakage. With a low coefficient of friction, plastic lumber is able to withstand large vessels bumping up against it with better resilience and durability than wood. Now that you are aware of some of the benefits of plastic lumber over traditional wood, below you’ll find different types of plastic lumber by Bedford Technology used for applications in many industries including marine, industrial, parks and recreation, equine, landscaping, outdoor furniture and more. This composite material can be used for many applications in a variety of industries. Engineered from recycled milk jugs and laundry detergent bottles, this plastic is strong, weather-resistant and is easily moldable into custom shapes. The foundation of Bedford Technology product lines start with SelectForce® by Bedford Technology. It is a strong and durable product that can be custom-molded and comes in traditional lumber profile sizes. There are two manufacturing processes that produce this material, one that yields a premium furniture-grade product and one that yields a more structural-grade product. Each environmentally-friendly process yields unique product characteristics to fit all types of project applications. This product is best-suited for projects requiring various lengths, unique profile shapes and an environmentally-friendly alternative to wood. FiberForce® by Bedford Technology is engineered with fiberglass strands which increases strength and rigidity. This product is best-suited for projects requiring wider span, structural integrity and dimensional stability. BarForce® by Bedford Technology is reinforced with fiberglass polymer rebar and is ideal for structural applications that will support heavy loads and increased dimensional span. This product is all manufactured in-house, including the rebar, which allows us to better regulate the quality standard. Bedford Technology tests this products against ASTM standards to ensure high-quality and structural integrity. Also known as Multi-X Technology, this product lines includes two profiles: SeaPile® and SeaTimber® by Bedford Technology. These products are specifically engineered for the marine industry. Stiffness can be varied and controlled to meet specific application requirements, and it is a great alternative to traditional wood, metal and concrete. Ready to Make the Switch from Traditional Wood to Structural HDPE Plastic Lumber?